More than 150 people died in last week's Kabul suicide blast, President Ashraf Ghani said as he opened multi-national talks on bringing peace. The bombing is the country's deadliest militant attack since 2001. Previous estimates said 90 people were killed. Mr Ghani's government has faced protests for failing to tackle the deteriorating security situation. He told the meeting it was time for the Taliban to embrace peace or "face the consequences". Representatives of 23 nations including the US and Pakistan, as well as the EU, Nato and the UN are attending the two-day meeting, which launches what is being called the Kabul Process for Peace and Security Co-operation. UK Ambassador Dominic Jermey said it was "an important marker for each and every country in the region to show its true support for Afghanistan's aspirations for peace". The meeting comes amid a downturn in the security situation. 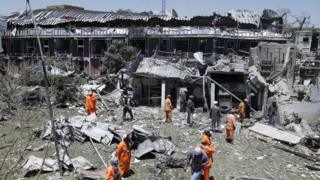 As the meeting got under way, a deadly blast hit the main mosque in the western city of Herat. Officials said at least seven people were killed in the bombing at an entrance gate. No group has said it carried out the attack. 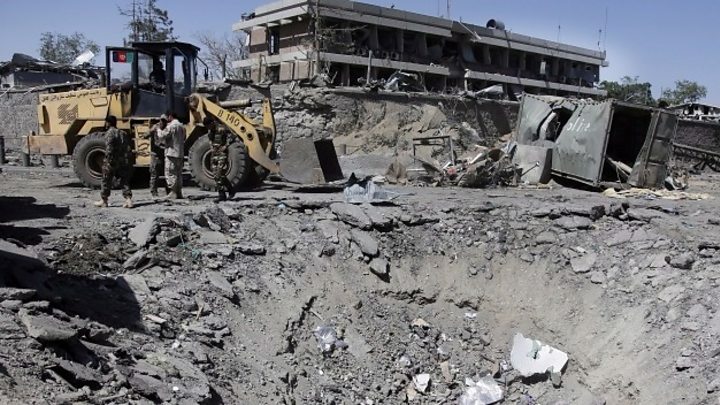 Earlier, a rocket fired by the Taliban struck a tennis court in the Indian diplomatic compound. Police said no-one was hurt. 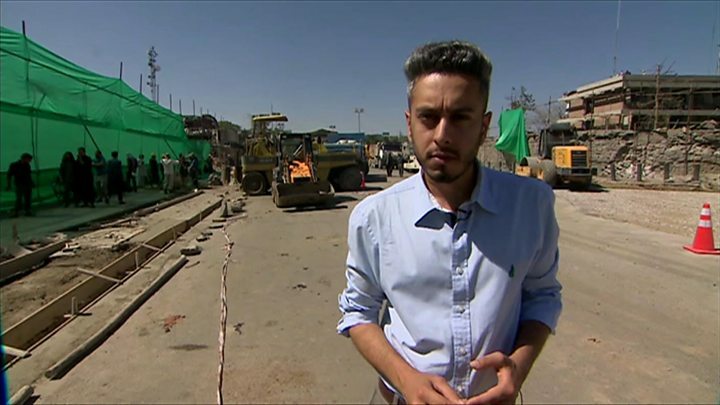 The bomb attack in Kabul was the deadliest by insurgents in Afghanistan since the Taliban were driven from power by US-led forces in 2001. It sparked anti-government protests in which four people were killed, as police used tear gas and fired bullets into the air to keep crowds at bay. Three suicide bombers then attacked the funeral at the weekend of one of those killed in the protests, killing at least seven people. Can the Afghan military turn the tide? It is not clear who was behind last week's attacks. The Taliban has denied any role, but the Afghan government says its affiliate, the Haqqani group, carried it out with support from Pakistan. Islamabad has strongly rejected the claim. The series of attacks have led to anger against the government, who residents accuse of failing to tackle the militants adequately. Earlier this year, a top US commander warned of a "stalemate" in the fight against the Taliban unless more foreign troops were committed. US President Donald Trump is believed to be assessing his options. The Kabul peace conference comes amid an acute foreign relations crisis, as the majority of Afghans accuse Pakistan of continuing to host the Taliban leadership and its most murderous wing, the Haqqani group. Pakistan denies the charge. Afghans also accuse Iran and Russia of helping the Taliban. The conference, which will focus on counter-terrorism, really needs to help the Afghans come to a political consensus to form a better or even a new government in Kabul that can win back public trust. But without US leadership, which has "owned" Afghanistan since 11 September 2001, there is little that other states can do or would even be willing to do. The real tragedy is that most distant states - but not the neighbours - are keen to wash their hands of Afghanistan. Meanwhile, the Taliban currently control huge swathes of the country. "We are offering a chance for peace but this is not an open-ended offer," Mr Ghani said, calling for Taliban to begin negotiations. A spokesman for the Taliban told Reuters news agency he had no comment to make on the conference. This is not the first attempt by the Afghan government to broker peace. But analysts say they want to regain momentum, against a back drop of separate peace talks engineered by Russia.